ONE OF MANKIND'S GREATEST LEGENDS HAS BEEN DISCOVERED. BUT NOT WHAT ANYONE WAS EXPECTING. It was just one year ago that she and her team of marine biologists had stunned the world with their incredible breakthrough. And now...they were about to do it again. But an ocean away, something strange was unfolding. Along a lonely coast in South America, an experimental Russian submarine -- long thought to have been dismantled -- has suddenly resurfaced. And the U.S. Navy has taken notice, sending officers John Clay and Steve Caesare to investigate. The sub has been studying a group of unmarked soldiers. Disappearing into the jungle each night beneath the cover of darkness. Something has been discovered. Something big. Unfortunately, the soldiers are about to learn that making the find of the century is one thing. Keeping it, is another. Outstanding, Michael Grumley is quickly moving to the front of the line of great story tellers! AMAZING!!! Read Breakthrough first, and hope there's a next one because I want more of Michael Grumley's creativity. Buckle your seatbelts, hang on to your oxygen masks and grab a box of kleenex, you're going to need them all. Her eyes opened wide with the phone receiver still gripped tightly in her hand. She immediately hung up and jumped out of her chair, rounding the desk and running for the door. After flinging it open and sprinting down the carpeted hallway, she approached the wide stairs and descended as quickly as she could without tripping. The layout of the new building was strikingly similar to the old one, but here the air conditioning system was barely able to stave off Puerto Rico’s brutal humidity. By the time she’d made it to the large double doors, the familiar flush through her body told her that her sweat glands were kicking into gear. She lowered her head and leaned into the doors, pushing them both open. The familiar computerized voice sounded almost immediately. Hello Alison. Sally wiggled her tail happily. We back. Before she could answer, Dirk plunged into the top of the tank with a giant splash and performed a barrel roll as he skirted past Sally. Alison laughed. He loved making a grand entrance. Of course, they really needed to change the part of the tank that allowed him to do that. Dirk continued to the bottom where he swung up and around before coasting in next to Sally. Hello Alison. Hello Chris. “We’re happy to see you too.” Chris Ramirez joined Alison in front of the tank, holding his perpetual cup of coffee. How he could drink coffee all day in this heat, she would never know. Their new facility was smaller than the aquarium in Miami, but this one was strictly a research center, which meant fewer unplanned distractions. Gutted from an old cannery, the building was refurbished and expanded to include a large indoor-outdoor tank for Dirk and Sally. Now they could come and go as they pleased. No more bars. It was, of course, the least she and the team could do after what they’d all been through. And true to their word, the dolphins returned regularly. It also helped that Dirk was fed like a king. Behind Alison and Chris, and against the far wall, stood an immense computer system with hundreds of blinking lights. IMIS, short for Inter Mammal Interpretive System, was the same system that made their first communications with Dirk and Sally possible. But now IMIS was over twice its original size. After her team relocated to Puerto Rico and closer to the dolphins’ natural breeding ground, the IMIS system had gone through a major upgrade. It was almost quaint to think about its abilities before, compared to its computing power now. It made Lee Kenwood, their head of technology, absolutely giddy. In fact, Alison and Chris had both joked to Lee that it looked as though he were trying to show up the engineers at NASA. Alison didn’t fully understand the specifications of the newly upgraded IMIS, but she did know it had a lot to do with what Lee called teraflops. But to her, it was simply bigger and faster. And even though it had doubled in size, Lee claimed it was almost eight times more powerful. The amount of data that IMIS could process before in a day, it could now do in a couple hours. Sally swam close to the underwater microphone. How you Alison? We good. You ready now. Alison glanced back at Dirk as he thrust his tail up and down, excitedly. She folded her arms in front and shook her head. If the world had been surprised at their breakthrough before, this time they were going to be absolutely stunned. “The Cradle of Naval Aviation” was the unofficial name of the Naval Air Base near Pensacola, Florida. It was built as the country’s first Naval Air Station and remained so even well into the First World War. In present day, it was known for being the primary training facility for all Navy, Marine, and Coast Guard aviators and flight officers. It was also home to the Blue Angels, the Navy’s famed flight demonstration squadron. Spanning an area of well over eight thousand acres, the Pensacola Naval Complex employed twenty-three thousand military and seventy-four hundred civilians. Not surprisingly, it was a major hub for modern hi-tech naval research and testing. It was also where Commanders John Clay and Steve Caesare, from Naval Investigations, had been living for the past two weeks. Both men briskly made their way down the long, polished hallway of the Naval Education and Training Command building’s third floor. When they reached the end, the pair stopped before a large white door. John Clay knocked and the door was promptly opened from the inside. Stepping into the room, Clay and Caesare recognized Rear Admiral David Einhorn, the commander of the NETC. Einhorn was sitting behind his desk with his Force Master Chief standing next to him, both of whom ceased their conversation and looked up expectantly when Clay and Caesare entered. Almost unnoticed, the lieutenant who had opened the door then silently stepped out behind them and closed it again. They’d been expecting this reaction, especially from Einhorn. After all, they’d already uploaded their report online and forwarded copies to both Einhorn and their own boss, Admiral Langford, a half hour ago. Their hand delivered copy was merely a formality. Judging from his reaction, Einhorn had read the online version already. Einhorn hadn’t wanted them there from the beginning. The failure with the drone was a fluke as far as he was concerned. Hell, as far as his entire staff was concerned. But it did happen. A new drone lost connection with its remote pilot for twelve seconds. It may not have seemed like a big deal to everyone else, especially since the connection was reestablished successfully, but it required an investigation. Not because the Navy necessarily worried about the connection, but because of what might have happened during those twelve seconds. A few years before, a Predator Drone had been captured in Iran by blocking the aircraft’s satellite connection back to its remote pilot in Arizona. Worse, Iran never had to hack the drone. They only had to keep the connection blocked long enough to force it into an emergency mode, which compelled the drone to get itself to the ground safely. It was a bug in the software: a mistake. Nevertheless, having the world watch their televisions and see Iranian soldiers dancing up and down on one of the Unites States’ four million dollar secret weapons was not something the Pentagon was willing to endure again. Einhorn furrowed his brow at Caesare. He didn’t care for either one of them. He had a department to run, one of the most important in the Navy, and he didn’t like these guys from investigations poking their noses wherever they liked. Yet, while Einhorn was not happy, he certainly wasn’t stupid either. It wasn’t clear why, but he knew both of the commanders standing before him reported directly to Admiral Langford, the President’s new Chairman of the Joint Chiefs of Staff. Langford had replaced General Griffith, who moved to fill the role of National Security Advisor after that position was unexpectedly vacated. Now Langford had the President’s ear, so Einhorn wasn’t about to do or say anything stupid. “So, what’s your recommendation then?” asked Einhorn, with heavy sarcasm. “I’m not sure, sir. It would depend on the resources available.” Clay knew Einhorn wasn’t going to like any estimate he offered, so he simply left it at that. Clay and Caesare both gave slight nods and spun around. They walked back to the door and exited without a sound. Truth be told, Admiral Langford never wanted the chairman job. But in the end, he was an officer and the President asked him to do it. And frankly, he was leery of who else would have been asked had he declined. Although he originally had his doubts, Langford decided that Carr actually had the fortitude and ethics to be a solid President. And that was something most military leaders longed for. “I hate surprises,” Caesare chortled. Clay and Caesare peered with anticipation at the screen. “And they captured it?” Clay asked. A single submarine catching another was quite a feat. “A skeleton crew,” confirmed Langford. “We haven’t asked them yet,” Langford replied, with a smile. Lee Kenwood was thrilled with their new lab. Finally able to separate their systems from the main observation area, it gave him some much needed elbow room to work on the hardware for their next project. And it was a doozy. He also appreciated the extra help from Juan Diaz, a Puerto Rican native and computer engineer, just a few years out of college. He was a fast study and incredibly sharp. Lee and Juan both looked up from a large table they were standing over as Alison opened the door, letting in a loud roar from the yelling children behind her. “Hi, Ali,” they said, in tandem. Lee punched a button on his keyboard and watched the results appear across the screen. Juan was carefully holding still a large device with a thin computer cable attached. The ‘zoo’ was approximately forty screaming, very excited children. During their big move to Puerto Rico, Alison and her team somehow managed to become local celebrities with all of the press. Earlier in the year, her team had officially revealed the amazing breakthrough of their IMIS translation system in a demonstration for several news crews. Not surprisingly, the news went global and people from everywhere quickly descended upon the aquarium to see for themselves. Their communications with the dolphins was deemed the ‘Achievement of a Lifetime’ by several magazines, and for the next two months, she and her staff were invited on hundreds of television and radio interviews. It was overwhelming, but it initially provided a welcome change of pace after what they’d been through. However, in the end, the attention and visits never seemed to let up, so their move off the mainland wasn’t just for their research; it was also for their sanity. Of course, no matter where they went, they were going to garner a lot of attention, and Puerto Rico was no different. In fact, the entire island went wild when they found out that one of their old buildings on the south side of the island, just outside of Ponce, would be converted into a new research center for the famous ‘Dirk and Sally.' What was a surprise was the reaction of the kids in Puerto Rico. In the States, during their early stages of research, Alison and her team played host to countless children on field trips, coming to visit the dolphins. Many of the kids were genuinely excited, but many others were not. Instead, they sat off to the side, glued to their cell phone screens. Alison had thought it odd at first, but after seeing the same thing class after class, it became downright depressing. However, she did remember a very special fifth grade class from Hedrick Elementary in Lewisville, Texas, and the Puerto Rican children reminded her of them a lot. In Puerto Rico, all the children were absolutely thrilled to come. Every face remained pressed against the thick glass the entire time. They couldn’t get enough, and, as a result, it couldn’t help but bring back some of that early excitement for Alison and her team. So, in exchange, they decided to do something special for the kids. Alison had an idea one day and talked to Lee and Juan about it. It took a while, but they managed to set up a smaller translation server for visitors. It had a much shorter vocabulary than the giant IMIS system and couldn’t translate new words, but it allowed the children to do something astounding: actually stand in front of the tank and talk with a real-life dolphin. Alison remembered watching the children type on the keyboard for the first time, thinking some of the kids might actually pop from the excitement. It was contagious. She had never seen Dirk and Sally so excited either. They would stay and talk to the children for hours until the very last one had left. Of course, Dirk and Sally were free now and they came and went as they pleased. So, when they did arrive, Alison and her team would promptly call the nearby schools to arrange some visits. And neither the children, nor Dirk and Sally, ever showed any signs of tiring. It was indeed a ‘zoo’ and she loved it. Lee nodded and turned back to Juan, who was showing him something on his monitor. As Alison turned to leave, her phone rang. She looked at the screen and answered immediately. “Hey there,” she said, smiling sheepishly. “Hi,” replied a deep voice on the other end. Of course he did, she thought. The man didn’t forget anything. He had a mind like a steel trap. He was actually kind of amazing that way. He not only knew how to listen, but he actually remembered what she said for more than ten seconds. Alison had to admit, he was nothing like she had expected when they first met. He worked for the Navy, a branch of the military she loathed. Of course, to be truthful, she hated all military branches. But as it turned out, John Clay wasn’t just some Marine jarhead. In fact, he was not only a man; he was a bona fide anomaly. He was smart, considerate, and devastatingly handsome. And those shoulders! “Bye.” She ended the call and remained staring at the phone. “I take it he’s not coming,” Lee said behind her. The plane was a C-20 Gulfstream III, which had arrived less than thirty minutes after their video call with Langford. Clay powered off his phone and closed his eyes, pressing his head gently into the leather headrest. He regretted hearing the disappointment in Alison’s voice. After a long moment and from the table between them, Clay picked up the folder containing his copy of the report on the Russian sub and flipped it open again. He remained quiet, thinking. Clay raised an eyebrow, waiting. Clay laughed. Outside, the dual engines of the Gulfstream reached maximum thrust, and the plane abruptly began to roll forward as the pilot released the brakes. The aircraft sped down the runway, building speed until it lifted smoothly into the air. As he watched the ground quickly fall away, Clay tried to relax, but couldn’t seem to dismiss something. It was a nagging question that should have been answered in the report, but wasn’t. "I HIGHLY RECOMMEND this novel, not only to sci-fi fans"
"5.0 out of 5 stars A great new series that really grabs you!" Thank you for reading Leap. This FAQ page is a small supplemental to the book, and answers common questions by readers. 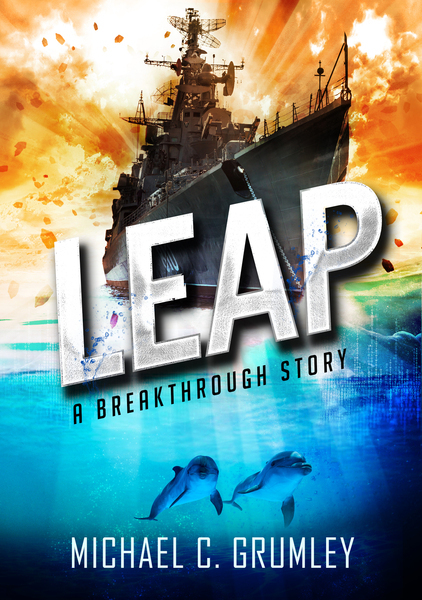 Please note that this page contains SPOILERS to the book, so if you have not read LEAP, please do so before continuing. Q: I loved Dulce. Will she be back in the next story? A: She will. In fact, Dulce plays an integral role in the next Breakthrough installment. Q: Have we seen the last of the capuchin monkey Dexter? Q: Does General Wei’s daughter survive? A: We shall see. On the other hand, there is a small secret buried in General Wei’s final moments with his daughter. If you read the passage carefully, it actually only mentions two of the three vials being injected into the daughter’s IV line. While some readers may assume that the third was used…it wasn’t. Q: What is buried beneath the coral in the final paragraph? It’s the ship, right? A: I think you already know the answer to that question. Q: Will we learn more about Palin and his people? A: Yes. As a matter of fact, in the future there will be a prequel to Breakthrough, which follows the cataclysmic event on Palin’s planet and their harrowing trip to Earth. To make matters worse, they arrive in the middle of World War II.